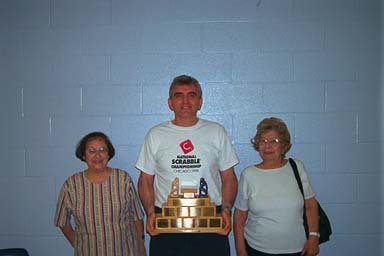 NSA Club #3 held its annual end-of-season club tournament on June 9th, 16th and 23rd, 1999, directed by John Chew. Modified Swiss pairings were calculated by computer, with crossover each round between the B and C divisions (each of which has an odd number of players). On day three, a last-minute no-show in B division resulted in a bye in B division in round 7, and in C division in rounds 8 and 9. Each of the divisional tournament winners (Zev, Vivienne and Shirley) also ended up with the highest club rating in their division, and is therefore the club divisional champion for the season.